This was one of those great recipes that Teresa’s mom had scribbled on an old index card with no measurements at all. It took a bit of experimenting until we got it just right, but it was well worth preserving! I couldn’t find my angel food cake pan, so I tried it first in a fancy bundt cake pan. It was pretty, but it fell apart, and you couldn’t see the apples since they were on the bottom. I tried again in a regular 9-inch circle cake pan and it worked perfectly and looked deliciously rustic. I had extra batter so my daughter made her own little version. This is a fairly hearty, heavy cake in texture, although it’s amazingly healthy for a dessert (no butter, no vegetable oil, and just 1/3 egg per serving!). It’s not as sweet or airy as a regular bakery cake, but it’s not supposed to be. It’s more of a pound cake, less of a slather-it-with-frosting cake. Serve in small slices with a little whipped cream or ice cream on the side. You will need an angel food cake pan to bake this—the kind with a tube in the middle and a removable bottom. 2. In a large mixing bowl, combine the eggs and the sugar and beat with an electric mixer on high speed until they are light and fluffy, at least 3 minutes. Add the applesauce, orange juice, vanilla, and salt, and mix again until just blended. 3. In a separate bowl, sift together the flour and the baking powder. Do not skip the sifting! It’s very important! Stir the dry mixture into the wet mixture 1/2 cup at a time. 4. Peel and core the apples, and then cut them into quarters. Cut each quarter into thin slices 1/4-inch thick. (Do not do this ahead of time, as the apple slices will turn brown!) Put half of the apples slices in a bowl and coat with cinnamon and sugar. Leave the other half plain. 5. Grease (really grease!) the pan, even the inside tube. Pour half of the batter in the pan. Lay the sugared apple slices in a single layer on the batter. Pour the remaining batter over the apple slices in the pan. 6. 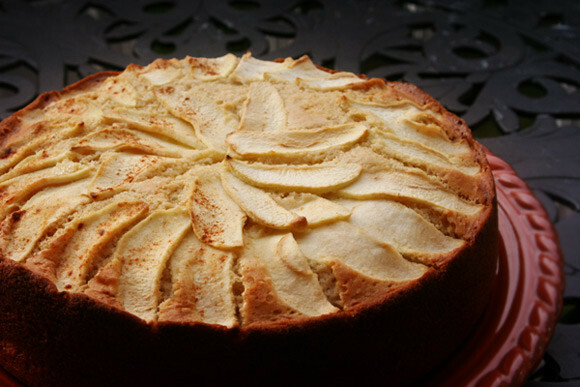 Carefully lay the plain apple slices on top of the cake in a spiral pattern, overlapping each other halfway. If they sink a bit, that’s OK. Bake for 45 minutes until golden brown. Set on a wire cooling rack to cool for 5 minutes. Run a knife around the inside of the pan and the tube. Carefully remove the cake from the pan, but leave it on the tube insert. Let cool completely on the wire rack. When cooled, slip a knife between the cake and the insert, and carefully lift up and remove the cake. Transfer the cake to a platter, with the apples on top. Serve with whipped or iced cream and coffee. I haven’t tried this yet but the recipe sounds delish….